Con Huevos: Here's What the Hype's All About! Con Huevos: Here’s What the Hype’s All About! Con Huevos is a matchbox of a restaurant, colorfully tucked just off the corner of Frankfort Avenue and Keats. The newest addition to the Frankfort Avenue food scene, it seems that Con Huevos made an instant impression on Louisville, word spreading quickly of their intensely flavored, Mexican-inspired dishes, many garnished with an egg, as the name would suggest. A longtime fan of the “put an egg on it” trend, I had little doubt that Con Huevos would satisfy my lunchtime cravings. I set my sights on their Huevos Rancheros on a recent, sunny Friday afternoon. Upon entering Con Huevos, I was awash in both the bold words peppering a long wall to my left (Fresh, Delicious, Pancake) and the enticing scents circling blissfully from the kitchen in the back. 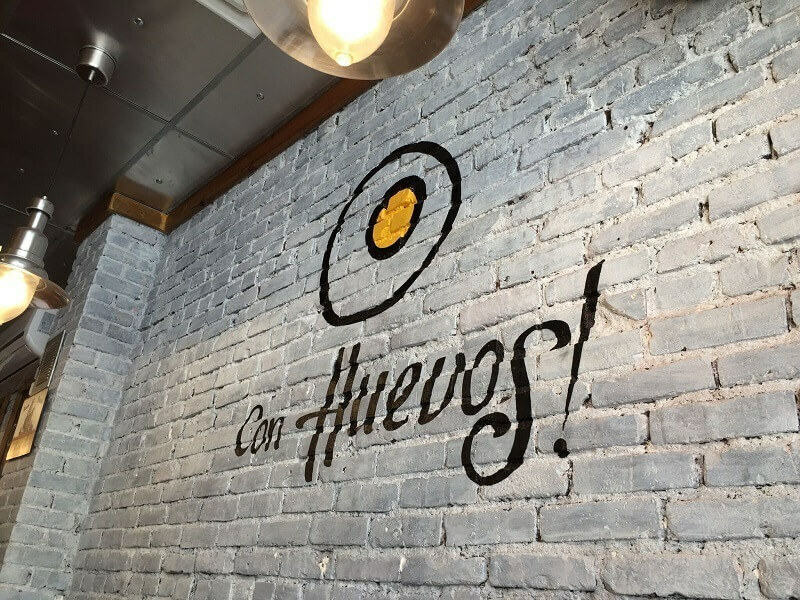 A shotgun-style space, the interior of Con Huevos manages to feel bright and airy, the yellow wall to the left countered by a white brick wall to the right, the Con Huevos logo splashed across the center and highlighted by the midafternoon sun seeping through the large front window. I immediately loved the atmosphere and found myself suddenly starving. I was joined by a dear friend and her kiddos, and we were able to claim a table for four by the window after ordering our food at the counter. With a fast-casual vibe, Con Huevos doesn’t offer table service, but does ask that customers wait to be seated until their food is ordered, allowing for shorter wait times and faster service. As it would be a sin not to sample a Mexican-inspired restaurant’s guacamole, we started with Con Huevos’ take on this beloved dip, a healthy serving of smashed avocado garnished with sliced cherry tomatoes, shaved carrot and peppery arugula. House-fried chips accompanied and were thick and packed with crunch, the ideal vehicle for this rich, but delicate, guacamole preparation. My girlfriend ordered what I initially told myself I was coming to Con Huevos for, the Huevos Rancheros. A bright ranchera salsa blanketed the bottom of the plate, three warm corn tortillas folded neatly over the top, black bean purée and queso fresco hiding within, just waiting to be discovered. Three dollops of avocado creme curved around the edge of the plate, a pile of freshly scrambled eggs—my friend’s requested egg preparation—falling overtop the tortillas and into the ranchera salsa. My eyes instantly knew what my stomach would soon confirm. This was an absolutely delicious dish. My intention to order the Huevos Rancheros was thwarted only by my discovery of the Torta Cubana, one of two sandwiches offered on weekdays (a selection of tacos are also available Monday through Friday only). Unable to resist the promise of both pork and chorizo in the sandwich, as well as a side of the house chilaquiles, a large, soft bolillo roll was soon set before me. The blend of pork and chorizo offered ample depth of flavor, the spiciness quelled only by the slices of avocado and queso oaxaca, but quickly set afire again thanks to a schmear of jalapeño aioli. Tomatoes and arugula contributed a bite of freshness, rounding out the sandwich into a perfectly balanced taste experience. A side of chilaquiles, housemade chips topped with crema and queso, is a welcome addition to the Torta Cubana. We were informed upon arrival that banana churros were available for dessert, and we claimed an order on the spot, finishing off our meal with balls of spiced and fried banana, a sweet custard poured overtop, the entire plate garnished with fresh blueberries and raspberries. We departed Con Huevos pleasantly satiated and with a full understanding of what the hype was all about. There is not a doubt in my mind that Con Huevos will quickly become a Frankfort Avenue mainstay, and we say welcome to the neighborhood! Con Huevos is located at 2339 Frankfort Ave. They are closed Mondays and open for breakfast and lunch Tuesday through Sunday. Hours Tuesday through Friday are 7:30 a.m. to 2 p.m., and Saturday and Sunday from 8 a.m. to 2:30 p.m. You can eat there or order takeout online here.